Saturday Night Live is one of the worst liberal shows on television. The sketch comedy program always poked fun at politics over the years but they consistently take it way too far when it comes to President Trump. 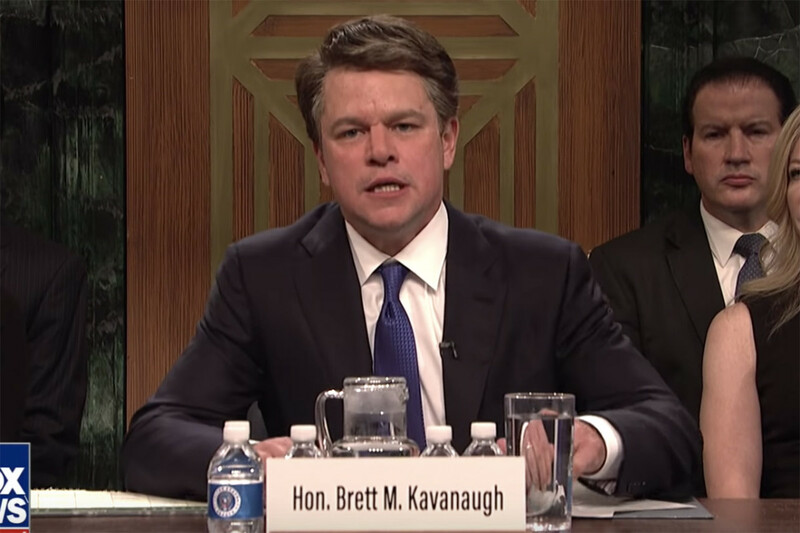 And because Trump’s Supreme Court Justice nominee, Brett Kavanaugh, was center stage in the news all week, this A-list actor portrayed him on SNL. Brett Kavanaugh should be a Supreme Court Justice by now. That is if it weren’t for the obstructionist liberals. Democrats scrutinized President Trump’s handpicked choice for the highest court in the land like nobody before him. The Senate Judiciary Committee asked ridiculous questions that have no relevance of whether or not he would be great as a Justice. That’s when the hearings went from bad to worse. Of course, Saturday Night Live hopped on the chance to parody Kavanaugh’s rebuttal to Dr. Christine Blasey Ford’s hearing. And you might be surprised to learn that it was none other than A-list actor Matt Damon. And that’s why he shocked everyone upon his entrance. The 13-minute opening sketch featured the regular cast as well as SNL alumnus Rachel Dratch as Sen. Amy Klobuchar. The writers and Damon portrayed Kavanaugh as an irate child. According to co-head writer Colin Jost, he contacted Damon to play Kavanaugh after midnight on Friday (the day before the show). Damon got on the next flight from California to New York and arrived at NBC’s 30 Rock studio at 4pm for the rehearsals. That’s how much the SNL and Damon wanted to unfairly defame Kavanaugh. And of course, Damon yelled a lot at the committee. When Kavanaugh spoke passionately after Dr. Ford’s testimony, he was emotional because he was defending his family name. He mentioned that it was one of the worst weeks of his entire life for him and his family. Who wouldn’t be emotional after allegations like that? It’s a he said/she said situation and liberals refuse to believe him even though he has an immaculate record. But the episode wasn’t all anti-Trump hogwash. Kanye West showed up in a Make America Great Again hat. The cast begged him not to wear it during the curtain call. So they ran off stage and West performed a song. That’s how much they hate anybody who likes Trump. They don’t even want to be in the same room as someone wearing Trump’s signature hat. The most ironic part of the choice of Matt Damon is that a frequent collaborator of his was disgraced producer Harvey Weinstein. Think about how tone-deaf that is. The alleged sexual predator was widely known for his grotesque actions and Damon never did anything about it. Also, Kavanaugh’s allegations are baseless. Do you think SNL should leave Kavanaugh alone?